Azaleas (rhododendron) are flowering shrubs which produce 3-6 inch clusters of white, pink, red, yellow, orange, purple flowers early in spring and early summer. They thrive in shade and do not tolerate hot sun. Continue reading below for a step-by-step DIY guide on how to start azaleas from cuttings and taking care of azalea plants growing in pots or garden beds. 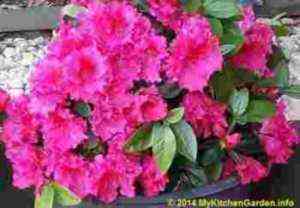 Growing azaleas is not difficult. Azaleas can be grown from seeds, cuttings, layering, grafting or by tissue culture in containers. Cuttings of most azaleas can be rooted quite easily. The new azaleas starting from cuttings are the exact copies (clones) of the parent azalea plant. While the evergreen azalea cuttings are easy to strike, the cuttings of deciduous azaleas are somewhat difficult to root. The difference between evergreen and deciduous azaleas is that while evergreen azaleas retain their foliage round the year, the deciduous azaleas lose their leaves in the fall. Can you root azalea cuttings in water? Azaleas cannot be rooted simply by putting their stems cuttings in water. The following guide is a step-by-step procedure on how most azaleas can easily be started from a cutting and reproduced. The propagation steps are the same for both the type of azaleas, the difference is in the selection of cutting as described below. The first question is when should you propagate azaleas? Well, you can start rooting azalea cuttings when the temperature is above 20 deg C. At lower temperatures, you can propagate azaleas indoors. Select a healthy, disease-free and insect-free azaleas shrub. The plant should not be water stressed, preferably they should be well-watered two days before taking the cuttings. Early morning is the best time to take azalea cuttings as for other plant propagation. Semi-hardwood cutting is taken to root. Select a branch which is somewhere between soft and brittle. Such a stem will not break like a matchstick and will not bend like rubber. You can find such a cutting after the spring flush of growth is finished. Take cuttings 4 to 5 inches long from the ends of branches. Make a fresh cut just below a node. Remove the flower buds, if any. Remove all leaves from the bottom one third and the top tip of the cutting, leaving 3-4 leaves. The cuttings from deciduous azaleas should be taken earlier when the wood is still soft and green. If you are not planting the cuttings immediately, then place them in a plastic bag. To prevent drying of the cuttings, put the bag in fridge. Take a small pot with many drainage holes at its bottom. wash it with soap and water and then submerse it briefly in water containing a few drops of bleach. Fill the pot with a well-drained rooting medium. I take equal amount of potting mix and river sand and mix them. Water well the pot and keep aside for about half an hour so as to drain all the excess water. Cut the lower end of the azalea stem just below a node. Scrap the one inch of the stem bark at the cut end with a sharp knife to encourage faster and denser rooting. Put this end in a rooting hormone powder or a liquid rooting hormone. Shake off any excess hormone. You can use a natural rooting hormone like willow water or honey. It may be mentioned that the evergreen azaleas root well without any hormone, but the rooting hormone will increase the chances of rooting in deciduous azalea cuttings. Use a pencil and make a hole in the rooting medium and insert the cutting in it, about one third its length without pushing. Ensure that the node and the scraped portion are under the soil. Firm the soil against the cutting. I put 3-4 cuttings in the same pot, keeping them spaced 2-3 inches apart. Do not water, the soil is wet and the stem has no roots yet. 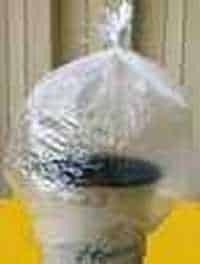 I always enclose the pot in a clear plastic bag and tie its end to keep the inside humidity close to 100%. This will prevent the cuttings to dry out. Alternatively, you can use a 2 liter soft drink bottle whose bottom has been removed. Invert this bottle on the pot and close the cap. Place the pot in bright indirect light. With soil moisture, there will be condensation on the plastic covering. Open the bag after about 8-10 days and see that the soil is moist, if not then add 2-3 drops of water. Over watering will rot the stems. In fact, I don't add any water for 20 days. the watering is needed only after roots are developed. In 5-7 weeks the cuttings will begin to form roots. Check for rooting by gently tugging on the cuttings. If resistance is felt, the cuttings are becoming successfully rooted. Remove the cap from the 2-liter bottles or make holes in the plastic bag covers to lower the humidity. After one week take out the pot and continue it to keep in shade, keeping the plant moist. 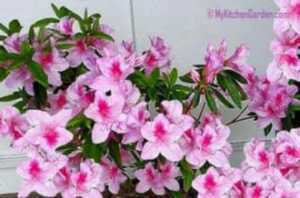 Next week allow the new azalea plant the morning sun for 1-2 hours. Gradually increase the morning sun. Keep the plant moist. Plants can be separated and transplanted when 3-4 sets of new leaves have grown. Choose a shaded place or which receive only the morning sun in garden, if planting in ground. I press the pot from outside from all sides to loose the soil inside. Gently upside down the pot holding the stems in your hand so that all the cuttings come out of the pot. Because the potting soil is sandy, all the cuttings will be separate. If not, then dip the cuttings with soil in a deep pot with water filled in and press the soil with your finger. This will separate the rooted cuttings.